Looking for a bus in National City? San Diego Charter Bus Company has access to hundreds of buses to take you to any destination along San Diego Bay and beyond. For a sun-soaked, multi-cultural adventure, add National City to the top of your itinerary. Situated in the San Diego Bay area, our community is home to scenic outdoor attractions like Pepper Park and Bayside Park. Because of our proximity to the border, your group can easily spend the day in Mexico and return to enjoy San Diego’s vibrant nightlife. Whatever events and activities your group has planned, San Diego Charter Bus will help you book spacious, comfortable coaches in minutes. When you call our reservation specialists at 619-209-7804, we’ll assist you in choosing among 18-passenger minibuses, 20-passenger minibuses, 25-passenger minibuses, 56-passenger coaches, and more. Our goal is to provide you with extensive transportation options, no matter what brings you to National City. With easy access to San Diego and Mexico, National City is a natural choice for your next group trip. 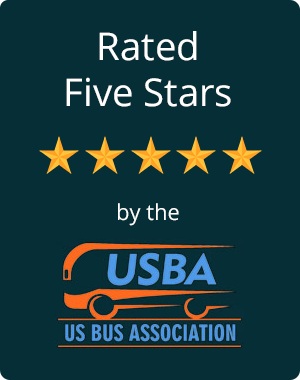 Instead of relying on public transportation or rideshare apps, keep everyone together while you travel with a charter bus rental by San Diego Charter Bus Company. For wedding and corporate conference shuttles, a minibus will efficiently transport attendees to and from your venue. If you’re planning a long-distance trip to a sports tournament or school field trip, a full-sized charter bus will comfortably fit your group members and their luggage, equipment, food, and more. With amenity options such as cushioned seats, on-board restrooms, and television monitors, everyone will be comfortable and entertained the entire trip. Flying into San Diego International Airport? Reserve a private airport shuttle to take your group safely to your hotel. After a long flight, a hassle-free ride through the city will be exactly what you need to start your trip out right. For itinerary inspiration and a breakdown of estimated rates, check out our comprehensive travel guide for the San Diego area. Group trips with friends and family should be fun. Take the stress out of finding and booking transportation by calling San Diego Charter Bus Company today at 619-209-7804. Our team of knowledgeable reservation agents will provide you with a free, personalized quote and will guide you through our simple online reservation process. If you have specific amenity requests, we will do everything we can to accommodate you. We’re looking forward to helping you plan the perfect National City trip today!